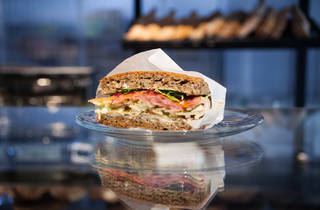 A brilliant bakery-coffee shop from the French-British team behind Le Bal Café and Ten Belles. 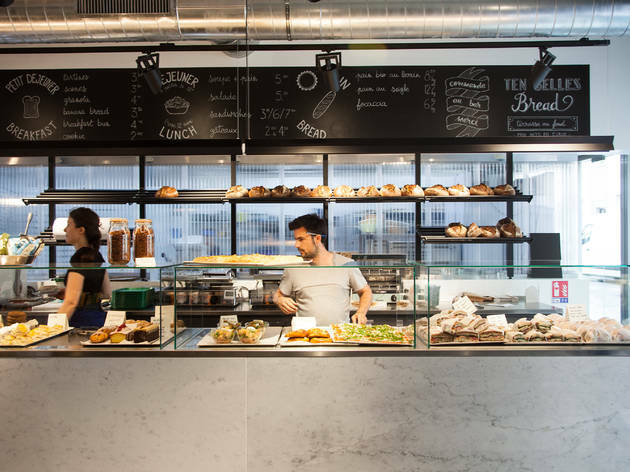 First there was Le Bal Café in the 18th, then Ten Belles near Canal Saint-Martin and this French-British team have now spread their wings to the 11th with Ten Belles Bread. 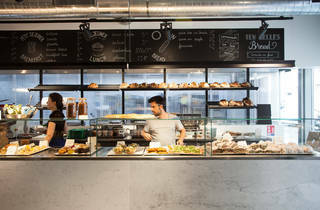 Located between the Marais and Republique, at the bottom of dazzling new office complex l’îlot Bréguet, the bakery-coffee shop is led by young chef duo Anna Trattles (formerly of London’s St. John) and Alice Quillet. 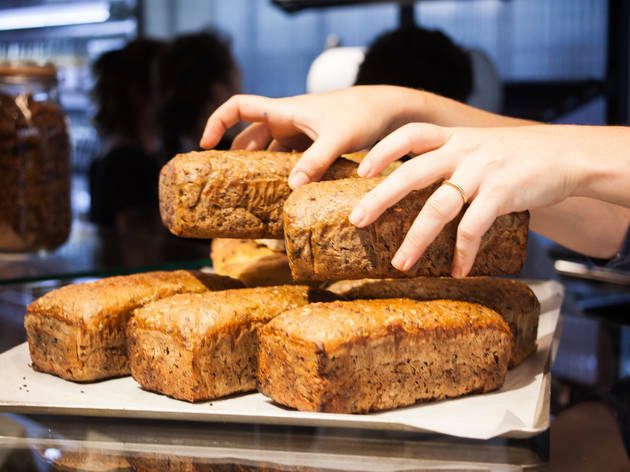 As the name suggests, the focus is bread – in all its glorious forms, freshly baked in the lab-like kitchen next door (watching through the huge glass windows is quite addictive). 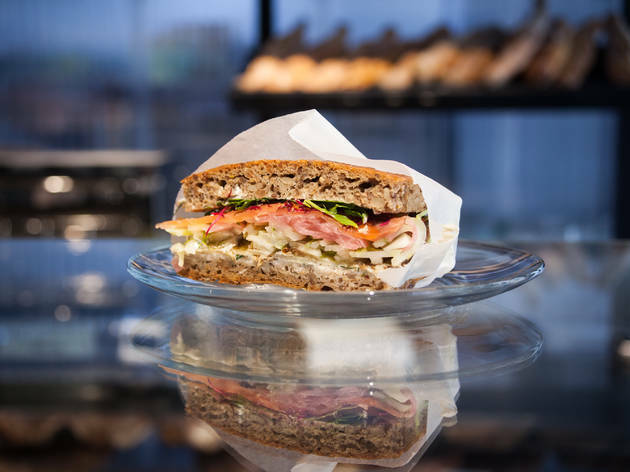 Think organic sourdough (a baker’s Everest to get right), rye and pillowy focaccia to buy by the loaf (from €6.50) or with gourmet, daily-changing fillings like goat’s cheese, broccoli and pecan or egg mayonnaise, pickled red cabbage and rocket (from €3.75). Expect Brit classics like chicken pie, bacon butties and scones too – the team’s Rose Bakery roots have not gone amiss. Desserts are equally spot-on – generous hunks of moist lemon cake and banana bread, as well as muffins, cookies and tarts. Expats hungry for the comforts of home – put this all-day joint on your to-do list. Coffee is a must here – sourced from Brûlerie de Belleville and served in glossy black crockery to match the New York-style dark metal interior, pepped up with some enviable house plants. While away an afternoon here, bathed in the nineties hip-hop soundtrack and shedloads of light, although the food would be just as satisfying wrapped in wax paper to take away. Expect us to be back soon for more of this astonishingly well-bred bread. *Brunch is served Saturdays and Sundays, with dishes including Welsh rarebit, Eggs Benedict, Eggs Royale and French toast with bacon and maple syrup at €15 or €25 for a full menu including a hot drink, freshly squeezed juice, toasts, butter, jam, a cooked dish and a cookie, muffin or financier.